A strong woman is an equal contributor in the success of her man. She supports him,motivates him,sacrifices for him so he could achieve what he aims for. Same is the story of our dear Vice President-HR ,Mrs. Anupama Katkar. Someone who has been through the journey of Quick Heal’s success. On the very occasion of International Women’s Day, Mrs. Katkar was invited as the chief guest in Ht. Rajguru School as a part of Shalangan Project.She was interviewed by Pankh Director- Mrs. Smita Apte. The interview was followed by felicitation of single mothers and a play performed by students. 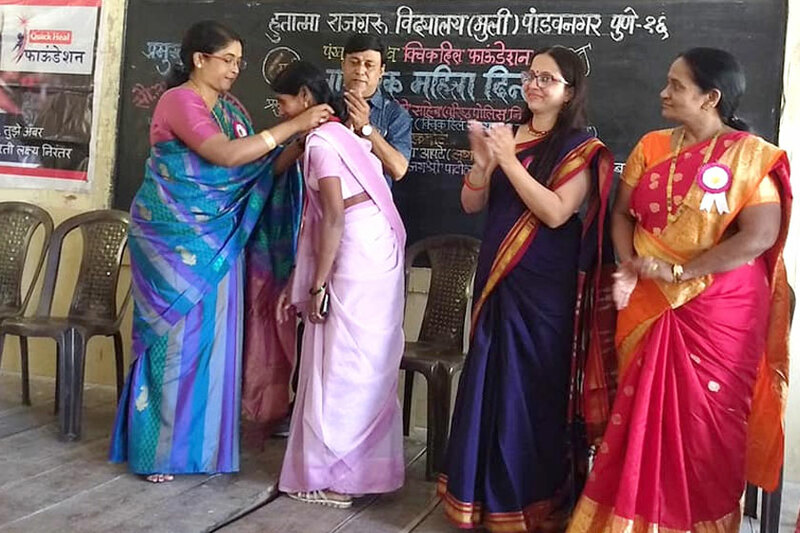 Dignitaries present included Mr. Ajay Shirke (CSR Head- QHF), Mrs.Kalyani Bhabad (Trustee,Pankh), Mrs. Maithilee Bandi (Coordinator,Pankh), Mrs.Patil (Principal, Ht Rajguru Girls School) and Mrs. Shete (Senior Faculty, Ht. Rajguru Boys School).